Who Is Fast Twitch For? What: Small Groups of 8 athletes or less. What if my child is only 11, should he or she be lifting weights? 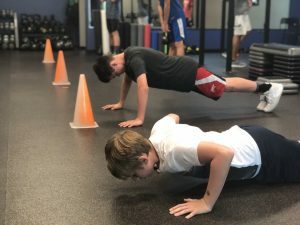 The answer is NO for 11 and 12 years of age we focus on speed, footwork, agility and power through things like bodyweight movements, flipping tires, etc. Anyone under the age of 13 (and sometimes older) is still rapidly growing and should NOT be lifting a lot of weights. What if my child isn’t a gifted athlete but just wants to make the team or earn more playing time? Our program isn’t just for the elite. We WANT to help each athlete reach their full potential, whatever that is for them. It’s not necessarily about being the next Steph Cury or Cam Newton – it’s about helping them improve mentally and physically. ​What happens if we go through the initial assessment and determine Fast Twitch isn’t appropriate for my child? Jeremy will either recommend another coach or trainer he trusts in the area, or make recommendations for other possible options available. Can my athlete lift during their season? Yes, but only if they’ve already been lifting weights and working out. 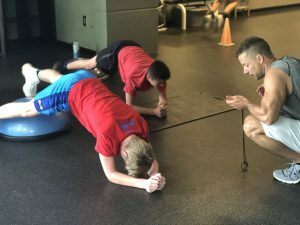 The in-season format is designed to help them maintain their strength and continue to help them with Proper Nutrition to Fuel their bodies for the best performance as well as mobility and stretching to prevent injuries. Are there any kinds of discounts for Siblings? Yes, we offer a $50 Discount for the second athlete on a three month program. Do sessions happen during school breaks? NO, we follow the Fayette County school schedule and do NOT hold sessions on days the athletes are out of school. This also means we add time to the end of the expiration date to account for weeks when we don’t offer workouts. (i.e. – Thanksgiving, Christmas, Spring Break, etc…) NOTE: Summer Schedules are Different. “I research everything before making an important decision. 7 years ago I put a tremendous amount of time trying to find the “right” training for my daughter. I wanted someone who understood sports, college athletes, sport specific training methods, and the right personality to suit her. [Jeremy] has been one of the greatest influences in Cassidy’s life.